Leaders of the emerging economies' bloc BRICS on November 30, 2018 reached broad consensus on the sidelines of the G20 summit here to uphold multilateralism and the rules-based world order. 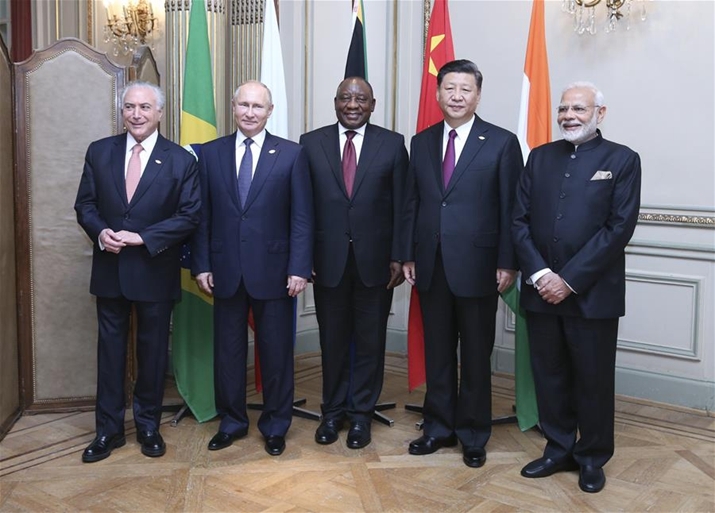 At the informal meeting chaired by South African President Cyril Ramaphosa, who is currently the BRICS rotating chair, the leaders also had an in-depth exchange of views on global economy, current challenges and cooperation within BRICS. Chinese President Xi Jinping, Brazilian President Michel Temer, Russian President Vladimir Putin, and Indian Prime Minister Narendra Modi attended the meeting. Speaking at the event, Xi said that BRICS leaders had a fruitful summit in July this year in Johannesburg, at which they reached important consensuses. Currently the world economy is facing rising risks, with multilateralism and the multilateral trade system adversely affected, said Xi, adding that this does not conform to the common interests of the international community. BRICS members should enhance unity, stick to the right direction, strengthen communication and coordination, demonstrate their sense of responsibility, and work jointly to keep global governance moving along the right track so as to promote world stability, development and prosperity, said Xi. The Chinese leader put forward a four-point proposal at the meeting, calling on BRICS members to firmly support multilateralism, to improve global economic governance, to continue to push for common development and to vigorously deepen practical cooperation within BRICS. On safeguarding multilateralism, Xi said that BRICS members should strengthen coordination within the frameworks of the G20, the United Nations and the World Trade Organization (WTO), and jointly safeguard the rules-based international order and oppose protectionism and unilateralism. On global economic governance, Xi underlined the need to adhere to the right direction in WTO reform. The key values and basic principles of the organization should not be discarded and the special and differential treatment for developing members must be guaranteed, he said. Measures should be taken to enhance the dispute settlement mechanism's role in adjusting trade relations and push for the reform of the international monetary and financial system, so as to increase the representation of emerging economies and developing countries, and allow them a bigger say in relevant affairs, said Xi. He said BRICS members should motivate other emerging economies and developing nations to prioritize development in the global policy agenda and fully implement the UN 2030 Agenda for Sustainable Development. They should adhere to the principle of "common but differentiated responsibilities" and jointly push for relevant parties to finish the negotiations on the implementation of the Paris Agreement on time, said Xi, adding that efforts should also be made to urge developed countries to honor their official promises on providing fund, technology and capacity building assistance to developing countries. As for cooperation within BRICS, Xi said that the members should accelerate the establishment of new industrial revolution partnership and jointly bring the benefits of BRICS cooperation to other emerging economies and developing countries. BRICS members are all important members of the G20 and they should support Argentina in hosting a successful G20 summit, and jointly send a strong signal on upholding multilateralism, strengthening international cooperation and promoting mutual benefit and win-win cooperation, said the Chinese leader. Brazil is to take over the BRICS rotating presidency and China will fully support Brazil to carry out relevant works, said Xi, adding that China will also work jointly with other BRICS members to deepen their strategic partnership and make greater contributions to world peace and development. Other leaders attending the meeting also expressed concerns over the rising unilateralism and protectionism, which have posed grave challenges to global politics, economy and trade. The ever-growing cooperation among BRICS is really inspiring against such a backdrop, they said. Members of the bloc should strengthen unity and cooperation, enhance practical cooperation on economy and trade, energy, science and technology, finance, cultural exchanges and healthcare, push for solid progress regarding the establishment of a partnership on the new industrial revolution so as to benefit the peoples of these countries, they said. The leaders agreed that BRICS members will speak with a strong voice supporting multilateralism and the rules-based multilateral trade system and opposing protectionism, so as to safeguard world peace and security, promote balanced and inclusive growth, improve the global economic governance and uphold the international order featuring equity and mutual respect. They pledged to enhance cooperation with African countries in implementing the 2030 Agenda for Sustainable Development and jointly safeguard the interests of emerging economies and developing countries. They also vowed to uphold the Paris Agreement on climate change and push for G20 leaders making a positive voice over the matter.